You’ve never seen a child so incredibly happy to get out and play in the snow. She would have spent the whole day outside if we had let her! The sweater that Berit knit! Our dear friend from Norway, Berit, knit a sweater and hat for Juliette as a present and brought it with her when they traveled here this summer to surprise Harald’s parents at their 50th anniversary party. Here are some pictures taken between Christmas and New Year’s when we were up on the north shore in Lutsen. I’ve got some short videos I will get around to uploading one day soon, too! For my family in Florida and elsewhere that might want them. You know, it’s been quite a long time since I’ve been to a southern funeral, and there were several things that struck me about yesterday, things that I found endearing and good to remember. I love the elders who don’t hesitate to say “Amen!” out loud during the eulogy when the preacher says something they agree with. Love it. Propriety be damned, preach brother, preach! Having an Elvis gospel song, complete with a gospel choir backup, played as special music, with nary a hint of irony. Love that even more. During the funeral procession, total strangers who pull over to the side of the road as they see the hearse and the line of cars with their lights on headed to the cemetary. That strangers would interrupt the busy flow of their daily lives out of pure respect and sympathy for the grieving family and loved ones with such a simple and yet profoundly symbolic gesture – it brings a lumpt to my throat every time I think about it. I am reminded of my early childhood, when cars would pull over on the side of the road, and the men would get out of their cars and take off their hats as a sign of respect. Such old-fashioned goodness and honor seems rarer and rarer to me these days, and that made it all the more special the many times I saw it yesterday. I admit, I miss the old-timey, at-home covered dish dinners that always followed a family funeral when I was growing up. That was just what we did in those days. Someone you know died, you went in the kitchen and cooked, and you took the food to the family so they wouldn’t be burdened with such a mundane chore as cooking at a time of great sorrow. But they don’t seem to do that up here. And somewhere along the way, I picked up another habit I maintained for years. I must have read about it in a book of rituals. I started draping all the mirrors in the house in black fabric, as a sign of mourning and a guard against vanity during times of grief. Now I don’t have that many mirrors anymore except in the bathroom, and those are really needed, so I don’t keep that tradition either. Seems like we are poorer for losing some of these traditions that helped to define and contain and formalize the mourning, as if it just isn’t right that we go right back into our daily routines immediately after a funeral, with no outer markers for ourselves or others to indicate the life-altering event that just occured. I guess I wish there were some things that had not changed. I will be able to fly home to Florida for 24 hours on Wednesday night, just long enough to be there for the funeral Thursday morning before flying home late that night. It’s awful to have to go under these circumstances, but it will be a really good thing for me to be with my mom and my family on Thursday. And, besides, I owe it to my aunt for every kindness she ever showed me (and there were many). 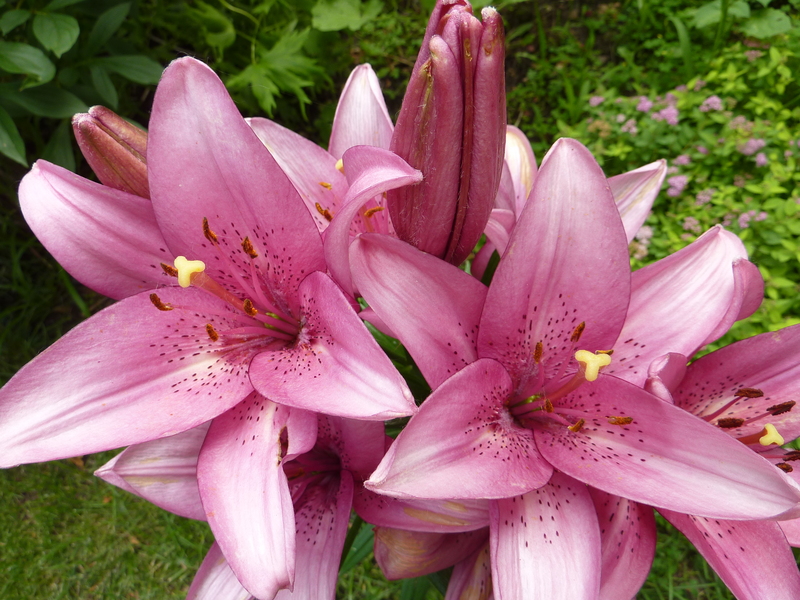 They are gorgeous pink lillies we grew this past summer …. a cheerful memory of a happier time …. Some of you are no doubt familiar with this famous quote from Henry van Dyke, the 19th century writer, poet and essayist. I love the imagery and am posting it for myself and for anyone else for whom it brings a moment’s worth of comfort.